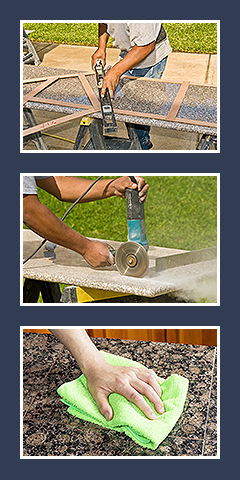 Maryland's Choice for Granite and Marble Countertops! We have a huge selection for you to browser in our warehouse from Marble, Granite and Quartz to Speciality items and Clearance Remnants. Visit our custom design center to see what our experts can do for you. What separates United Marble and Granite from other countertop fabricators? We believe in customer service and we stand behind our work. If something is ever wrong, we make it right. It's that simple..
We have the shortest template to install lead times in the industry (7 business days) so you can get your countertops with the least amount of inconvenience. You can rest assured we have the fabrication knowledge and skill to create the countertops you have envisioned. Our showroom featuring plenty of displays and full size slabs of material in every color we stock. We work with many dealers, contractors and home centers in your area. So, regardless of where you buy your countertops, United Marble and Granite can be your fabricator. contact United Marble & Granite. United Marble & Granite carries quality materials, we choose from the highest quality stone available.